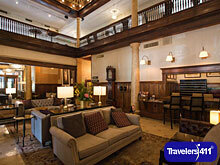 Since 1909, Hotel Boulderado has offered Rocky Mountain elegance in the heart of downtown Boulder. Located one block from the famous Pearl Street Mall, Hotel Boulderado features 160 guest rooms decorated with either a modern mountain or historic Victorian style. Hotel Boulderado exudes the welcoming, friendly and unconventional charm that makes the “People’s Republic of Boulder” so beloved. Stop in for coffee, cocktails and conversation in Hotel Boulderado’s famous atrium lobby. Ride the original Otis elevator. Sit on the patio of locals’ favorite, The Corner Bar. Climb the grand staircase where thousands of Boulder brides and grooms have said “I do.” Enjoy creative, contemporary cuisine and brunch all day, every day in Spruce Farm & Fish. Check out License No. 1, the first Boulder bar to sport a liquor license. If you want real Boulder, you’ll find it at Hotel Boulderado. Creighton Smith, General Manager was on the September 15, 2018 "Travelers411" Radio Show in hour 1.